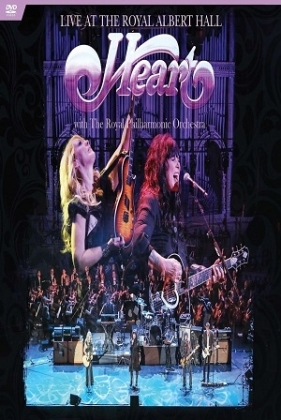 Heart: Live At The Royal Albert Hall With The Royal Philharmonic Orchestra DVD. In June 2016 Heart made their first ever live appearance at London s famous Royal Albert Hall. To make the sold-out night even more special the band were accompanied by the Royal Philharmonic Orchestra which added further depth to Heart’s songs. Opening up with ‘Magic Man’, the Wilson sisters Ann and Nancy command the stage, the captivating vocal from Nancy and the swaggering guitar playing from Ann held the crowd spellbound. A truly magical way to open this special concert. ‘Heaven’ is the first track to feature The Royal Philharmonic Orchestra and this is where the cameras come into their own, with lots of mutli-angle shots and fast editing make this a joy to watch as you are immersed in the gig. This song really does benefit from the added depth the Orchestra bring. The Royal Philharmonic join Heart for the next four tracks, from the eons old ‘Dreamboat Annie’ through to one of their newest tracks ‘I jump’. The sound on the dvd is crystal clear, the picture quality is near perfect, if a little dark. My only complaint is that the Orchestra is pushed to the sides and back, and we see very little off them, which is a shame as they really add to the Heart sound. ‘These Dreams’ and ‘Alone’ are welcomed by the crowd like long lost friends, before current single, the very powerful ‘Beautiful Broken’ allows the band to really rock it up. The epic ‘Crazy On You’ has a brilliant vocal performance from Nancy and some great edited crowd shots really drive this song along. Fast and ballsy. Not many bands, if any, can get away with doing a Led Zeppelin track as an encore, but Heart have been doing this for years, getting away with it, and enjoying it. For tonight’s gig the Wilson sisters cover ‘No Quarter’, captivating the audience with the haunting melody before finally giving their fans what they want, another Heart classic, Barracuda. ‘Kick It Out’ rounds off this storming gig at the Albert Hall, as they leave the stage to a thunderous applause. Heart were joined onstage by Ben Smith (Drums); Dan Rothchild (Bass); Craig Bartock (Guitar); Chris Joyner (Keyboards) and, of course, The Royal Philharmonic Orchestra conducted by Nick Davies. This dvd was a joy to watch, great editing conveyed the atmosphere of the gig perfectly, and a superb mix allowing you to turn the volume right up. Heart, The Royal Philharmonic Orchestra - What About Love.